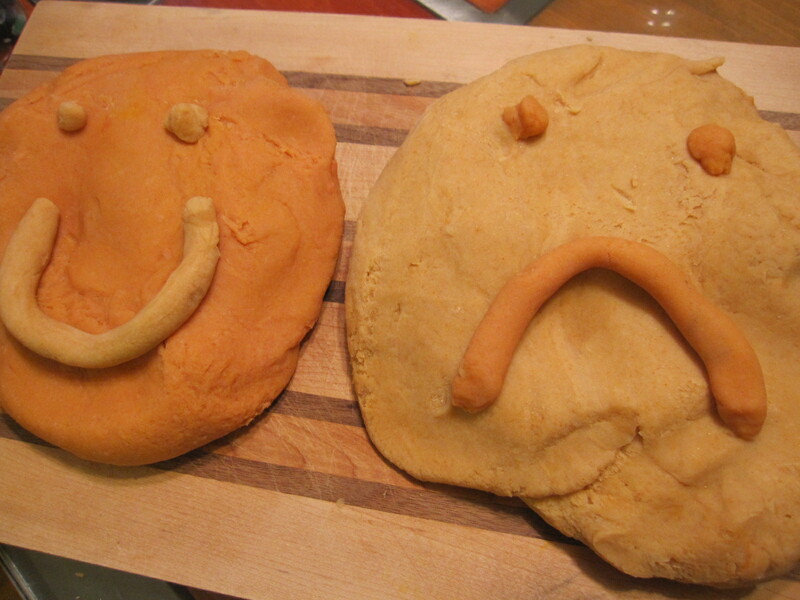 Playdough Showdown: Fake vs. Natural but Unimpressive | Laura's "Rules"
Sigh. Sometimes the right candidate doesn’t make such a strong showing. On occasion, the better politician is all downwards-looking, weak and vague, and even seems slightly embarrassed about his own record. Sometimes such a candidate disappointingly lets every single opportunity for a zinger go by, and spends almost an entire debate talking about the flaws in his opponents’ phantasmagorical policy proposals rather than focusing on stonewalling he’s faced from his opponents’ partisans, or on, say, math. And sometimes the artificial — even the utterly invented and commercially suspect — triumphs, in a brilliant show of plumage, like a peacock made only of lights and sound. Such was the depressing outcome of my playdough showdown yesterday, pitting food dyes against natural colors for home-made playdough in a twisted mom’s homage to both the Presidential match-up and the playdough-like consistency of our national political debates. When tasked several weeks ago by Maya’s preschool to make up a batch of brilliantly colored blue playdough for a color study, my research showed that blue in natural coloring is typically achieved by boiling red cabbage. 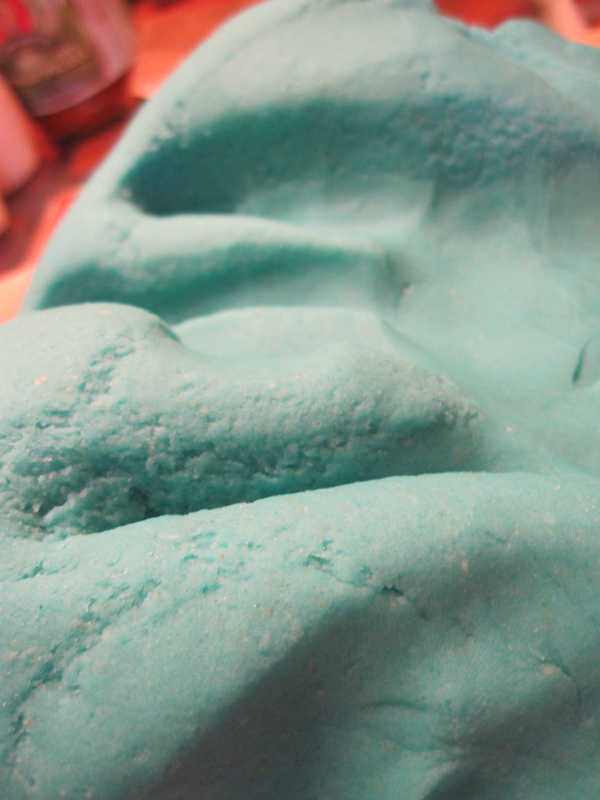 Furthermore, it seems, sometimes this particular playdough retains a strong cabbage-y odor, or, in Thrifty Mama’s words, “really stinks” and is “tacky” in texture. 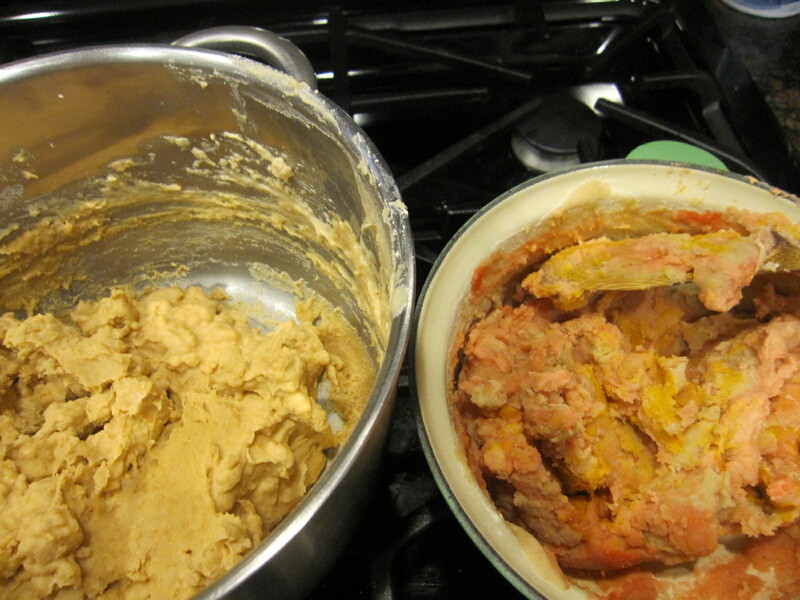 I will note that there is no odor on the blue dough from my wonderful Eco-Dough, which I gather also uses red cabbage, but they likely have fancy ways of extracting dyes that I do not. Having no desire to stanky up the preschool, I violated my principles and ordered the most assertively blue food-dye I could find, which worked like a charm. If you’re gonna’ go fake, go big. It was blue, all right, and not at all smelly. 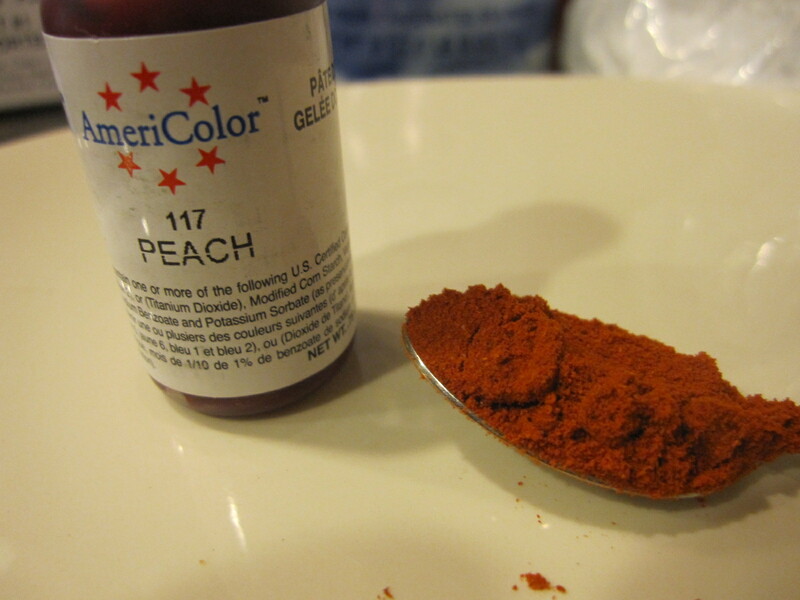 Still, when a follow-up was given to me to tackle orange playdough, I couldn’t help but wonder about the natural alternatives to the small bottle of “peach” dye that came as part of the set. So I set up a head-to-head — an oh-so-titillating contest (I don’t get out much) between the dye and the power of paprika, which was recommended on several blogs for producing orange. It looked good at first, with the bright orange paprika promising to school the buttoned-up bottle. 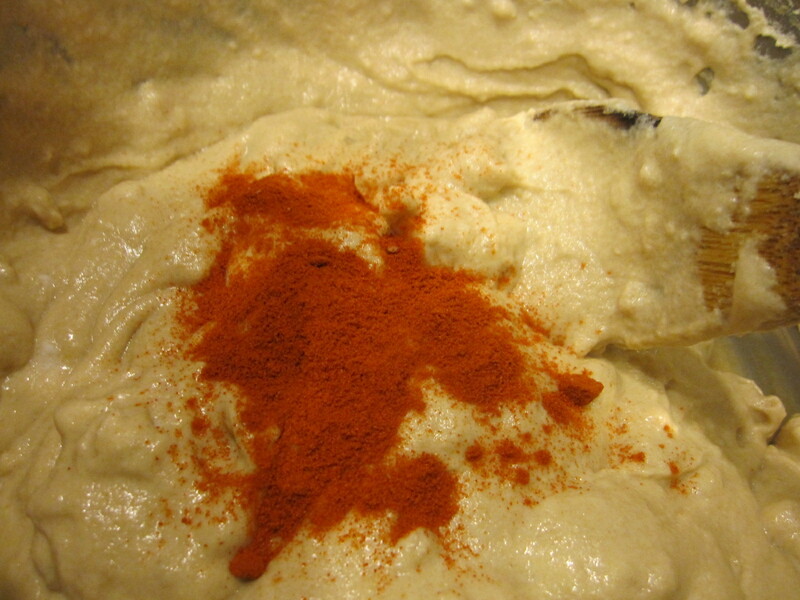 I used this basic recipe both times, which works really well. 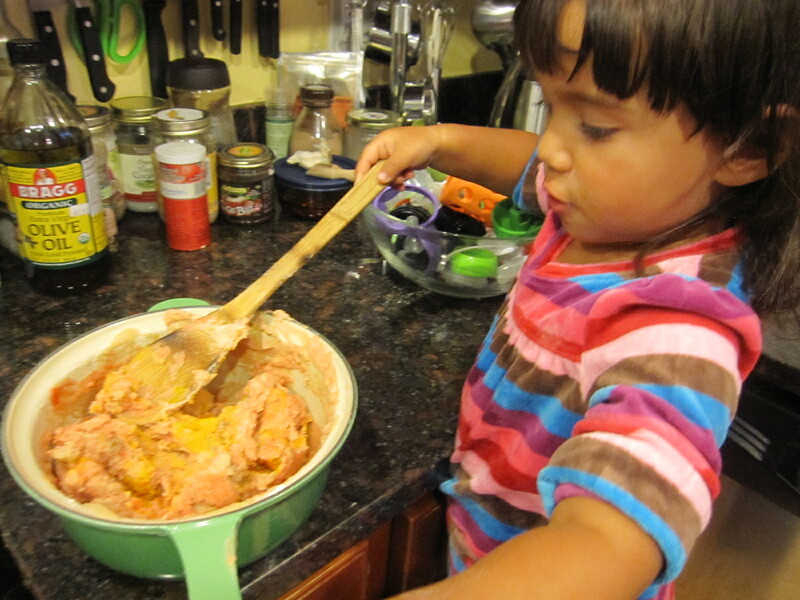 There are no-cook options, but the preschool teacher mentioned that the cooked ones have much more staying power. Add all the ingredients to a large pot (bigger the better) and stir over medium heat until it starts to clump around the spoon. Add dye or coloring and stir a little more. You can — and even perhaps should by all rights — take it off the stove for a minute to let your assistant take a turn. 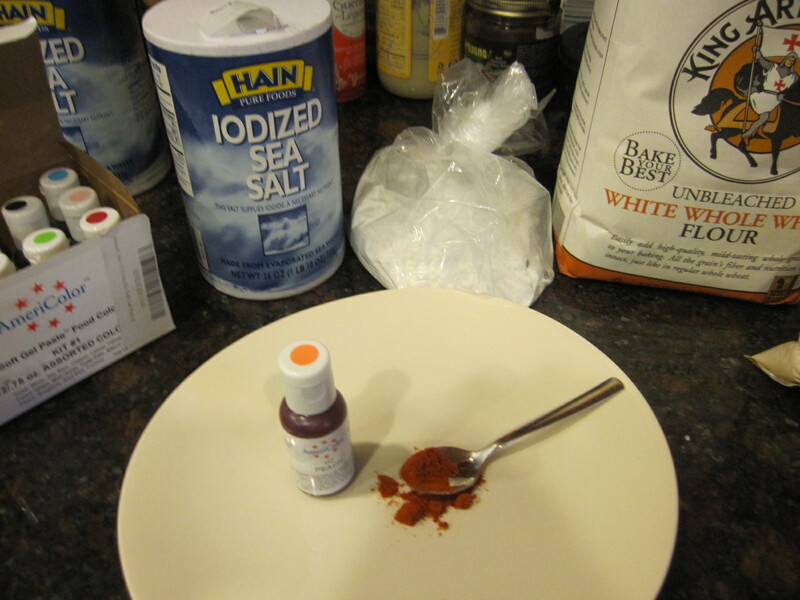 After a minute or two, remove from heat and scrape onto a cutting board. 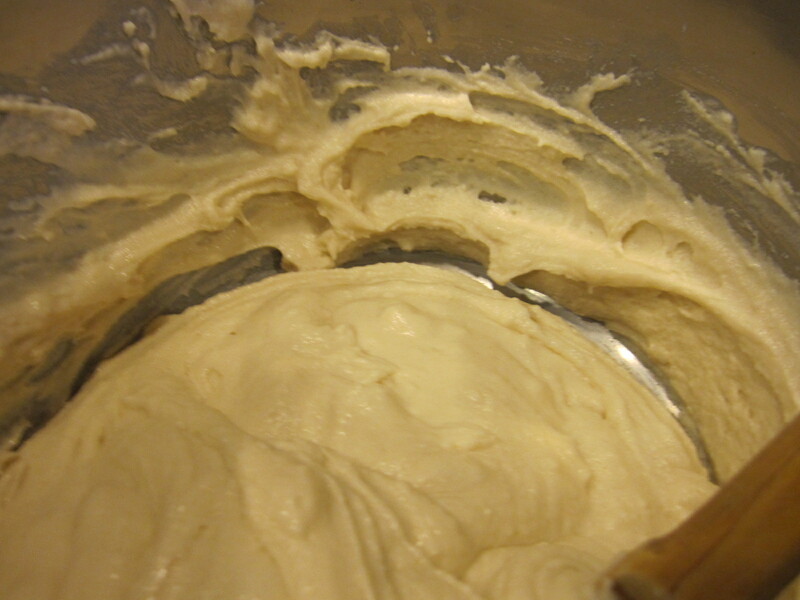 When cool enough, knead firmly until the color and consistency are uniform. Shoo kids away until you are done playing. ### As you can see, the paprika on the left, which was the good stuff from Bulgaria courtesy of my folks, produced a very disappointing light orange-ish hue, like pumpkin flavored pasta. On the other hand, the food dye, corrected with a squirt of the yellow that came in the same box, morphed into a convincing, if not bright, orange. Ah well. We can’t win them all. And my little contest was, well, slightly less important than that other one. In the end, I mushed it all together and bagged it up as orange enough. 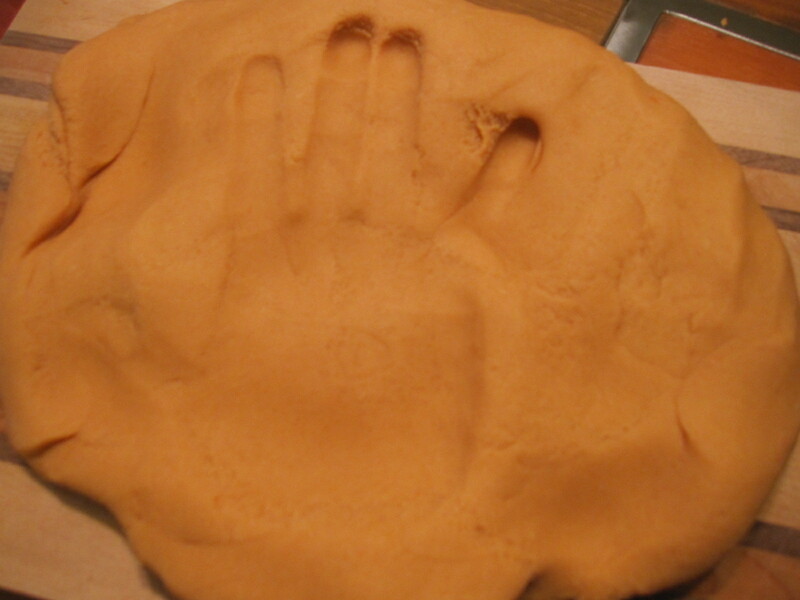 Punching the dough into a pliable mass was satisfying in between muttering at the television. Still, it’s frustrating when the one you know to be best for the country stumbles a bit, and lets the insubstantial, chemical-laden candidate win the day. This entry was posted in Recipes & DIY and tagged artificial, blue, Cabbage, Color, cream of tartar, debate, Dough, Dye, dye number, elasticity, fake, Flour, Food Colors, food dyes, making, natural, natural playdough, Obama, Odor, orange, peach, play dough, playdough, politicians, Potassium bitartrate, preschool, project, Romney, Shoo, toddler by Laura MacCleery. Bookmark the permalink. Great piece. I enjoyed the debate analogy and your tireless search for authenticity and inspiration in your art project and your politics. It’s all about food coloring – about making things appear differently – changing the chemical mix and coming out with a new story that is shinier and brighter and more colorful and filled with artificial ingredients. Too bad you can’t put a warning label on the candidates. Thanks so much Roberta dear!